Tallow Beach Houses offer two bedroom funky beach houses nestled in a 30 acre wildlife sanctuary behind the sand dunes on Tallow Beach. All beach houses have reverse cycle air conditioning, open plan living/dining and kitchen areas that flow onto a verandah overlooking the native gardens. These unique beach houses offer a private and romantic escape for your next Byron holiday. Enjoy a walk along the bush tracks of Suffolk Park, surf on Tallow Beach or relax with a BBQ in your own secluded hideaway. The magnificent stretch of Tallow Beach is situated a short ten minute drive south of Byron Bay town centre. An easy walk through bushland finds you on a 6km stretch of pristine beach running southward from the Byron Lighthouse. Here you can enjoy the solitude of uncrowded expanses of white sand and rolling waves….wonderful for long leisurely walks. 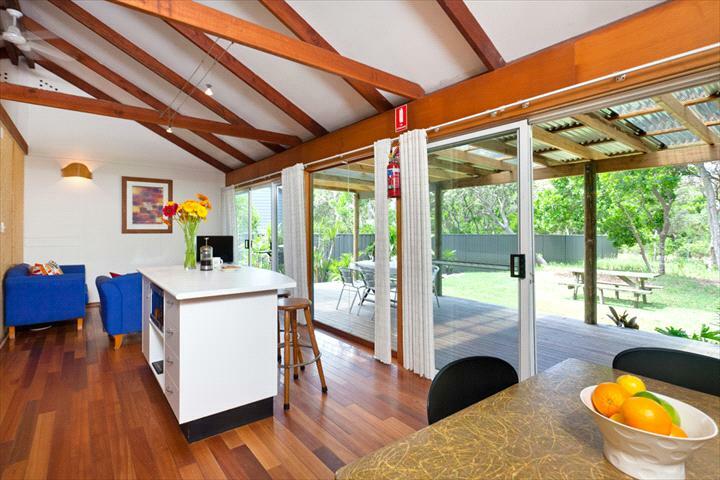 The beach houses are located 2 mins walk to Tallow Beach and a 10 min drive to town centre.